Jen Wilkin's newest book, In His Image, continues the consideration of God's attributes which she began in her book None Like Him:10 Ways God Is Different from Us (and Why That's a Good Thing). The earlier book focused on characteristics of God which are unique to Him and not transferred ("communicated") to believers in Christ; attributes like omniscience, omnipresence, and self-existence fall in that category. In His Image, on the other hand, examines God's communicable attributes, characteristics like kindness and holiness which God does work into Christians through the sanctification process as we are conformed to the image of Christ (Rom. 8:29). Many books already exist on the attributes of God. A. W. Tozer's The Knowledge of the Holy and Arthur Pink's Attributes of God are notable among them, and Wilkin acknowledges her debt to previous writers. What sets Wilkin's book apart? First, her engaging, clear, contemporary writing style and knack for apt illustrations mean that here the cookies are most definitely on the bottom shelf. She communicates rich, challenging content without lofty, hard-to-understand style. Second, her decision to place the incommunicable and communicable attributes of God in separate volumes adds clarity and, I suspect, has a teaching benefit in keeping the categories clearer for readers. Third, each chapter closes with Scripture references and reflection questions. This book and its companion volume are excellently suited for use as small-group or one-on-one discipleship materials, or in a book club focused on Christian books. The general index, Scripture index, and blank pages for notes and reflection also suit such a purpose. My explicitly stated intention for this book is that we learn to identify God’s will for our lives. Our inclination is to discern God’s will by asking, “What should I do?” But God’s will concerns itself primarily with who we are, and only secondarily with what we do. By changing the question and asking, “Who should I be?” we see that God’s will is not concealed from us in his Word, but is plainly revealed. 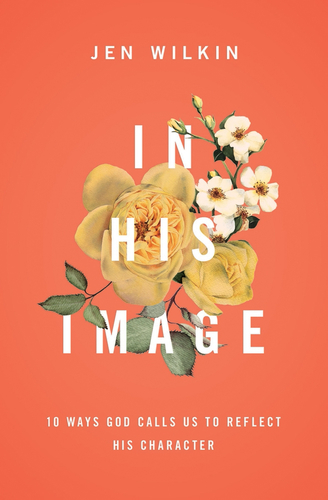 The Bible plainly answers the question “Who should I be?” with “Be like Jesus Christ, who perfectly images God in human form.” God’s will for our lives is that we conform to the image of Christ, whose incarnation shows us humanity perfectly conformed to the image of God. In this book, we will consider how we can demonstrate a resemblance to our Maker. But since the Bible’s answer to “Who should I be?” is “Be like the very image of God,” we must ask, “Who is God?” (pp. 21-22). If I have ever encountered God's attributes or the question of finding God's will expressed and organized in quite this way before, I don't recall it. The way Wilkin lays it out here, however, is so clear and consistent with Scripture that I wonder why I didn't see it before. Christians are called and enabled to be holy, loving, good, just, merciful, faithful, gracious, faithful, patient, truthful, and wise because the triune God is, and the Spirit of God dwells in us. "God’s discipline is his justice without wrath, for the purpose of training us in godliness" (64). "Abundance. Initially, grace is unasked for and undesired. God in his sovereignty extends grace to us before we can even contemplate its possibility or its worth. Eternally, grace is unearned and undeserved. We grow to recognize it for what it is, and we even become increasingly bold to ask for it in greater measure. But the moment we begin to ask out of a sense of entitlement, we contaminate grace. To demand it is to defile it." (87). "The Bible is our great Ebenezer, a memorial stone to the faithfulness of God, carefully recorded and preserved for his children. When we grow forgetful of God, or when we question whether God has forgotten us, we can turn there to gaze on his steadfast love to all generations" (100). "Every entertainment of temptation questions the goodness of God" (103). "Becoming better people is the process of reflecting with increasing clarity and fidelity the very face of God. God’s will for our lives is that we be restored to mint condition. God’s will for our lives is that we become living proof. Everything we say or do will either illuminate or obscure the character of God. Sanctification is the process of joyfully growing luminous. Through Christ and by the Spirit, we have regained access to God’s presence. And the result is the glorious reclamation of the image of God in man" (153). To sum up, I thoroughly enjoyed and highly recommend In His Image to anyone wanting to know God more, searching for God's will for her life, or looking for a substantial but not overwhelming discipleship resource. The two-volume set of None Like Him and In His Image would make an excellent graduation gift with lasting impact. Readers already familiar with older classics on God's character will also benefit from Wilkin's clarity and emphasis on application, which is to say, the call to grow more like Christ. Crossway provided me a complimentary PDF copy of this book in exchange for an honest review. The links in this post are Amazon affiliate links.